Description: Having lost a good opportunity at Spring Hill to hurt significantly the Union Army, Gen.
John B. Hood marched in rapid pursuit of Maj. Gen. John M. Schofield’s retreating Union army. Schofield’s advance reached Franklin about sunrise on November 30 and quickly formed a defensive line in works thrown up by the Yankees in the spring of 1863, on the southern edge of town. Schofield wished to remain in Franklin to repair the bridges and get his supply trains over them. Skirmishing at Thompson’s Station and elsewhere delayed Hood’s march, but, around 4:00 pm, he marshaled a frontal attack against the Union perimeter. Two Federal brigades holding a forward position gave way and retreated to the inner works, but their comrades ultimately held in a battle that caused frightening casualties. When the battle ceased, after dark, six Confederate generals were dead or had mortal wounds. Despite this terrible loss, Hood’s army, late, depleted and worn, crawled on toward Nashville. The Second Battle of Franklin (more popularly known simply as The Battle of Franklin) was fought at Franklin, Tennessee, on November 30, 1864, as part of the Franklin-Nashville Campaign of the American Civil War. It was one of the worst disasters of the war for the Confederate States Army. Although the Union Army of the Ohio, commanded by Maj. Gen. John M. Schofield, left the field after the battle, the Confederate Army suffered devastating losses—including six generals killed or mortally wounded—in its unsuccessful frontal assaults against the Union defenders, sometimes called the "Pickett's Charge of the West." A further loss at the subsequent Battle of Nashville in December marked the end of Confederate General John Bell Hood's Army of Tennessee as a fighting force. 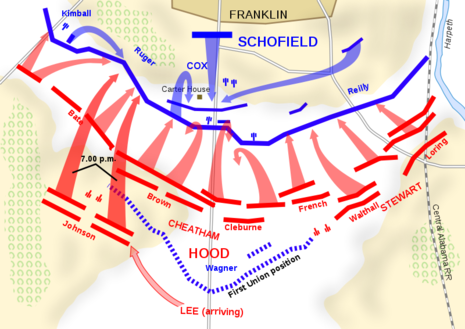 The Battle of Franklin followed the Battle of Spring Hill of the previous day. Hood's Army of Tennessee had allowed Schofield's Army of the Ohio to slip by it relatively untouched during the night. Hood had hoped to destroy Schofield before he could link up with the Army of the Cumberland, commanded by Maj. Gen. George Henry Thomas, in Nashville, about 18 miles north of Franklin. That combined Union force would be over 60,000 men. When the armies met at Franklin, however, Hood had approximately 38,000 men to Schofield's 30,000. Schofield's advance guard arrived in Franklin at about 6:00 a.m., after a forced march north from Spring Hill. Brig. 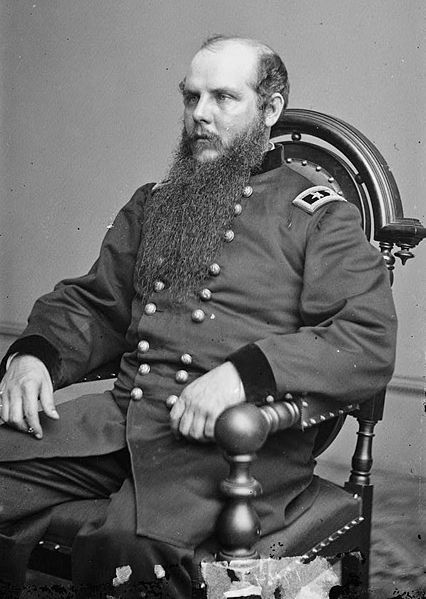 Gen. Jacob Dolson Cox, a division commander temporarily commanding the Union XXIII Corps (and later governor of Ohio), immediately began preparing strong defensive positions around breastworks originally constructed for the First Battle of Franklin in 1863. The defensive line formed approximately a semicircle around the town, from northwest to southeast; the other half of the semicircle was the Harpeth River. Schofield's decided to defend at Franklin with his back to the river because he had no pontoon bridges available that would enable his men to cross the river; the bridges had been left behind in his retreat from Columbia because they lacked wagons to transport them. He needed time to repair one of the two permanent bridges spanning the river (both of which had been burned) and to lay planking over the undamaged railroad bridge to enable it to carry wagons and troops. His supply train parked in the side streets to keep the main pike open, while wagons continued to cross the river, first via a ford next to the burned-out pike bridge, and later in the afternoon by the two makeshift bridges. By the beginning of the assault, nearly all the supply wagons were across the Harpeth and on the road to Nashville. By noon the Union works, a strong exterior line fronted by a ditch and a secondary support line some 65 to 40 yards (37 m) behind the center, were ready. Counter-clockwise from the northwest were the divisions of Maj. Gens. Nathan Kimball (IV Corps), Thomas H. Ruger (XXIII Corps), and Cox (XXIII Corps). Two brigades of Brig. Gen. George D. Wagner's division of IV Corps were a half mile forward of the center, screening the Confederate approach, with orders to fall back if pressed. Brig. 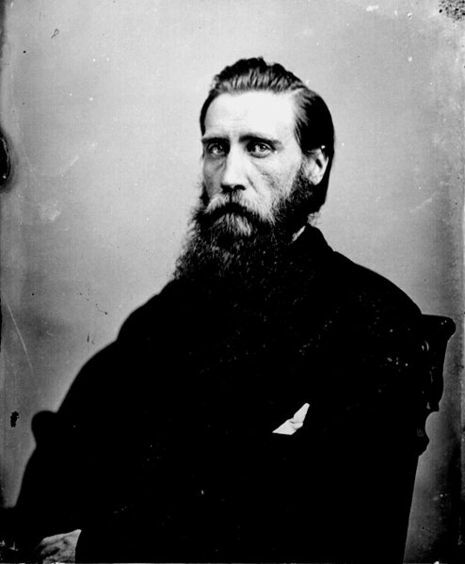 Gen. Thomas J. Wood's division of IV Corps was posted north of the Harpeth to watch for any flanking attempt. Schofield planned to withdraw his infantry across the river by 6:00 p.m. if Hood had not arrived by then. Hood's army began to arrive on Winstead Hill, two miles (3 km) south of Franklin, around 1 p.m. Hood was noted for his aggressive, sometimes reckless battlefield leadership, and had, since his assumption of command of the Army of Tennessee, stung it with the criticism that the troops were reluctant to fight except behind breastworks. Over the objections of his top generals, he ordered a frontal assault in the dwindling afternoon light against the Union forces, now strongly entrenched behind two lines of breastworks, and with Wagner a half mile in front. Many believe that Hood was still angry that the Federal army had slipped past his troops the night before at Spring Hill. But Hood's definite and immediate objective was to try to crush Schofield before he and his troops could escape to Nashville. The Confederates began moving forward somewhere between 3:30 p.m. and 4 p.m., with Maj. Gen. Benjamin F. Cheatham's corps on the left of the assault and Lt. Gen. Alexander P. Stewart's on the right. The Confederates, without artillery support, had to traverse two miles of open ground, in view of the Union soldiers. Hood's attack initially enveloped Wagner's forward brigades under Lane and Conrad, which despite orders not to engage in front of the works, stood their ground. Whether or not Wagner ordered the change in orders from those issued by XXIII Corps commander Gen. Cox remains a matter of controversy (Wagner claimed he did not; one brigade commander contradicted him in official reports and Wagner was relieved of command in December). The veteran soldiers of these brigades fled back to the main breastworks, while untried replacements were reluctant to move under fire and were captured. The fleeing troops were closely pursued by the Confederates, eventually intermingling with them, so much so that defenders in the breastworks could not fire without hitting fellow soldiers. Officers in Strickland's brigade (Ruger's division, west of the turnpike) had understandably failed to prepare for such an event. This, combined with the opening in the works through which the Columbia Pike passed, caused a weak spot in the Union line at the Carter House. The Confederate divisions of Maj. Gens. Patrick Cleburne, John C. Brown, and Samuel G. French converged on this spot and a number of their troops broke through the now not-so-solid Federal defenses. Strickland's regiments fell back to avoid capture. A spontaneous counterattack, led by the brigade of Col. Emerson Opdycke and fortified by rallied elements of Wagner's men, newly mustered regiments such as the 44th Missouri, 175th and 183rd Ohio, and two veteran Kentucky regiments, managed to seal the gap and kill, capture, or repel the Confederates who had penetrated the defense, after brief but vicious hand-to-hand combat. By 5 p.m., when the sun set, the Union line was again firmly entrenched. Meanwhile, on the east side of the battlefield, Maj. Gens. William W. Loring and Edward C. Walthall saw their troops torn apart. Maj. Gen. William B. Bate on the west side of the field fared no better, and no further assaults were attempted on the flanks. In the center, however, the Confederates, believing that an irreparable breach had been made and seeking to exploit it, made repeated but uncoordinated assaults on the Union second line. After dark, around 7 p.m., the division of Maj. Gen. Edward "Allegheny" Johnson attacked and had no more luck than its predecessors, but was the only division of Lee's intact corps to be ordered to attack. Large numbers of Confederate troops became pinned down in the ditch fronting the main line, and an intense firefight transpired for hours, each side firing through embrasures or over the top of the parapets at close range in an attempt to dislodge the other. That Union troops were armed with repeating rifles added to the already considerable advantages of the defenders. By 9:00 p.m. the fighting had mostly subsided. The overall attack had been awesome, described by some as a tidal wave, and known as the "Pickett's Charge of the West." But it was actually much larger than the famous charge at Gettysburg. 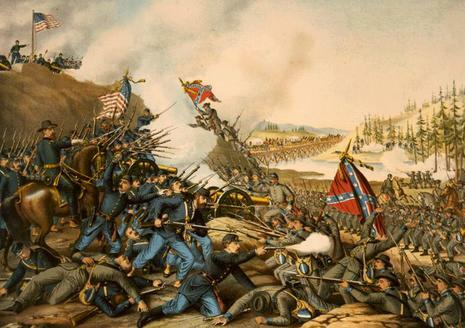 In the East, 12,500 Confederates had crossed a mile (1.6 km) of open ground in a single assault lasting about 50 minutes. In Franklin, some 19,000 marched into the guns a distance of nearly two miles (3.2 km) and conducted assaults in multiple waves that lasted over five hours. Across the river to the east, Confederate cavalry commander Maj. Gen. Nathan Bedford Forrest attempted to turn the Union left flank, but the Union cavalry under Maj. Gen. James H. Wilson repulsed his advance. As was usual during his career, Forrest's advice as to the disposition of the enemy, and weaknesses discovered and reported, was ignored by his superiors. Schofield, who spent the battle in Fort Granger (just across the Harpeth River, northeast of Franklin), ordered his infantry to cross the river, starting at 11:00 p.m., despite objections from Cox that withdrawal was no longer necessary. (Union reinforcements under Maj. Gen. A.J. Smith were already in Nashville.) Although there was a period in which the Union army was vulnerable, straddling the river, Hood was too stunned to take advantage of it. The Union army began entering the breastworks at Nashville at noon on December 1. The devastated Confederate force was left in control of Franklin, but its enemy had escaped again. Typically, a Civil War battle was deemed a victory for the army that forces its opponent to withdraw, but here, Hood's "victory" came at a frightful cost. More men of the Confederate Army of Tennessee were killed in five hours at Franklin than in two days at the Battle of Shiloh. The Confederates suffered 6,252 casualties, including 1,750 killed and 3,800 wounded. An estimated 2,000 others suffered less serious wounds and returned to duty before the Battle of Nashville. But the military leadership in the West was decimated, including the loss of perhaps the best division commander of either side, Patrick Cleburne. Fifteen Confederate generals (six killed or mortally wounded, eight wounded, and one captured) and 53 regimental commanders were casualties. The six generals killed or mortally wounded were Cleburne, John C. Carter, John Adams, Hiram B. Granbury, States Rights Gist, and Otho F. Strahl. Union losses were 189 killed, 1,033 wounded, 1,104 missing, most of whom were prisoners, both wounded and unwounded. Many of the prisoners, including all captured wounded and medical personnel, were recovered on December 18 when Union forces re-entered Franklin in pursuit of Hood. The Army of Tennessee was all but destroyed at Franklin. Nevertheless, Hood immediately advanced against the Union Army of the Cumberland and the Army of the Ohio, firmly entrenched at Nashville, despite being outnumbered and exposed to the elements, thus leading his battered forces to further, and final, disaster in the Battle of Nashville. Having proved even to Hood's satisfaction that they could assault breastworks, the Army of Tennessee had shattered itself beyond the possibility of ever doing so again. The Carter House, which stands today and is open to visitors, was located at the center of the Union position. The site covers about 15 acres (61,000 m2). The house and outbuildings still show hundreds of bullet holes. The Carnton Plantation, home to the McGavock family during the battle, also still stands and is likewise open to the public. Confederate soldiers swept past Carnton toward the left wing of the Union army and the house and outbuildings were converted into the largest field hospital present after the battle. Adjacent to Carnton is the McGavock Confederate Cemetery, where 1,481 Southern soldiers killed in the battle are buried. Adjacent to the 48 acres (190,000 m2) surrounding Carnton is another 110 acres (0.45 km2) of battlefield, which is currently being converted to a city park. Much of the rest of the Franklin battlefield has been lost to commercial development. The spot where Gen. Cleburne fell, for instance, was covered until late 2005 by a Pizza Hut restaurant. Although the restaurant was purchased by a preservation group and demolished, the Civil War Preservation Trust continues to rank the Franklin battlefield as one of the ten most endangered sites. City officials and historic-preservation groups have recently placed a new emphasis on saving what remains of the land over which this terrible battle raged.